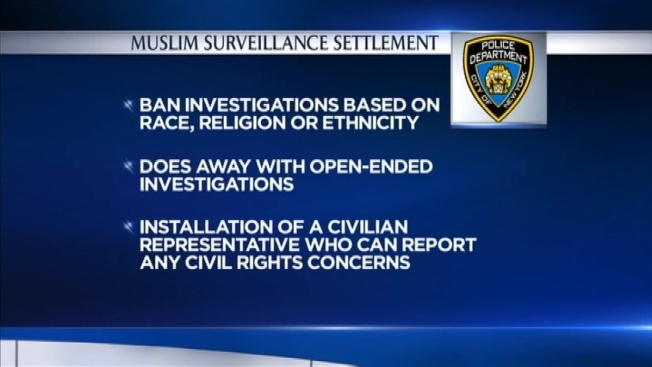 The NYPD has agreed to increase oversight of its counterterrorism programs as part of a settlement of two civil cases alleging the nation’s largest police force unfairly targeted Muslims in the decade following the Sept. 11 terror attacks. The New York Civil Liberties Union announced Thursday that the police department agreed to several new guidelines for investigations involving political or religious elements – including the appointment of a civilian representative who has never worked with the NYPD who can review the department’s terrorism investigations. “This settlement is a win for all New Yorkers. It will curtail practices that wrongly stigmatize individuals simply on the basis of their religion, race or ethnicity. At the same time, the NYPD's investigative practices will be rendered more effective by focusing on criminal behavior, said Arthur Eisenberg, the NYCLU’s legal director. The civilian representative would be a lawyer appointed by the mayor. He or she would ensure the department was following policy regarding political and religious activities. Any violations would be reported to the police commissioner, who could then launch an investigation. If violations proved systematic, the NYCLU says the civilian monitor would report to the judge who oversaw the settlement. Several other changes are also set to be instituted as part of the settlement. Some, the NYPD said in a statement, have been longstanding practices. The NYPD admitted no wrongdoing as part of the settlement. "The proposed settlement does not weaken the NYPD's ability to fulfill its steadfast commitment to investigate and prevent terrorist activity in New York City," said Deputy Commissioner of Intelligence and Counterterrorism John J. Miller. "The terms of the proposed settlement, which are the result of extensive and thoughtful conversations between representatives of both parties and NYPD leadership, include the incorporation of long standing best and sound NYPD practices into the Handschu Guidelines, which were last modified in 2003." The announced changes stem from a pair of suits filed in 2013. In one, leaders from mosques and other Islamic community and religious organizations alleged that the NYPD unfairly targeted them in anti-terror dragnets because of their religion. In a second case, it was alleged that the police force violated a long-standing decree to protect New Yorkers from being watched while carrying out legal political and religious activities.